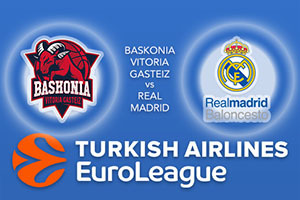 This is an all-Spanish clash in the Euroleague and we could be in for a cracker come Friday evening. This is because the hosts have bounced back to winning ways after a brief slump that has allowed the away side to open up a gap between the teams. The home team knows that this is an opportunity to pull their domestic rivals back, and this game has the makings of a great game. The home team haven’t lost to Real Madrid in the Euroleague and when these teams met earlier in the season, it finished in an 87-91 score line. That was a stunning night when Jaka Blazic provided 21 points and there was a strong showing from Johannes Voigtmann who provided a double-double in the victory. There is no shortage of fantastic players in the Real Madrid side and it is likely that Sergio Llull will have a big role to play in this game, offering an average of 18 points per game. Jaycee Carroll has also been in fine form this season, offering an average of 9 points per game while Gustavo Ayon has offered an average of 9.7 points per game. It can be difficult to predict how the games between domestic rivals pan out in the European arena, and there is a lot of arguments pointing towards both teams coming out on top. Real Madrid have been in excellent form but you should look at Baskonia Vitoria Gasteiz at -1, which is available at odds of 1.90. For the Over/Under market, look to go OVER 172.0 at odds of 1.90. Bet Now!